The event being shown in this picture is the party upon the arrival of Lind in which Caleb ignored her. During this scene I felt Lind felt lost and confused, almost as if she was misplaced. She didn�t feel like she was wanted because Caleb, the one who granted her the teaching job, was now ignoring her. I represented the conflict between Lind and Caleb in the diagonal lines in the floor pattern and dinner tables between them. The out of focus colourful pictures, carpet, and food was made to show Lind�s confusion about the meaning behind Caleb�s ignorance of her. By mixing all the colours together, I felt a feeling of confusion emitted as many different emotions are portrayed. Lind herself is uncoloured to better represent her feeling of misplacement, sort of like an orange in an apple tree, out of place. You may also notice the floor fading from white to black, black towards Caleb and white towards Lind. The white towards Lind represents the fact that she is just an innocent victim. The black represents the evil power Caleb has in the situation, the power of ignorance. Lind is also placed in the middle of the frame so the viewer is forced to relate to her feelings rather than Caleb�s who is off to the side. The event being shown in this picture is when Mark Jordan invites Lind inside his home because she�s walking in the rain, and they share a romantic hand holding session while getting to know one and other. I wanted to show how this was a new beginning for Lind as this was one of the first people she felt strong emotions towards in the new town. 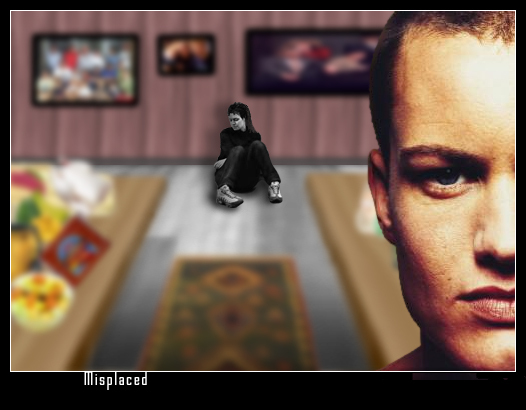 I also wanted to show that she is developing strong emotions towards Mark. The whole picture is along a horizontal axis in order to show a feeling of peacefulness. I placed green trees in the window to represent the new beginning in the form of a new love. The red towel hanging over Lind�s arm is over top of her roughly knit sweater, I felt that the rough knit nature of the sweater represented confusion as there�s no straight line pattern but rather a sort of chaos when referring to line patterns. By having a red towel with a predominately vertical line pattern over top of the sweater, I felt this showed her powerful new emotion of love now over coming her old feelings of confusion. Lind is also wearing red nail polish to represent the feeling of love. 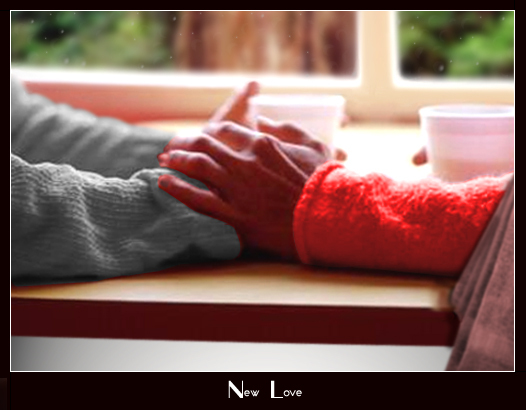 The walls below the table have a white glow to show that this love is of a pure nature, and the black sweater Mark is wearing represents the mysteriousness of his origin. The event being shown in this picture is after Lind�s students leave, she begins to feel quite sad because of the absence of Mark, only to be surprised as Mark shows up. I wanted to portray that Lind was overcome by a feeling of loneliness/sadness and Mark came to bring the feeling of love and happiness. I added a blue hue over Lind and her desk to show the feeling of sadness that she was experiencing. 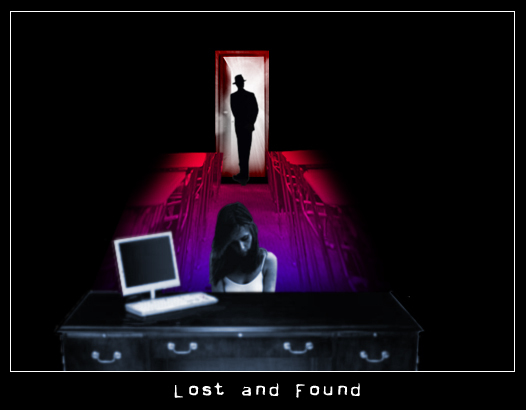 The dark mysterious man in the doorway (Mark) is darkened only because of the abundance of red light that cascades around him, the abundance of love he�s bringing to Lind. The blackness of Mark also represents his mysteriousness and sexiness. The desks are separated in a path between Mark and Lind to show that nothing can come between them and there love is never ending. The blue and red colours clashing across the desks just show contrast between the two feelings and because they are along a diagonal line shows the action of opening the door caused the feelings to clash. 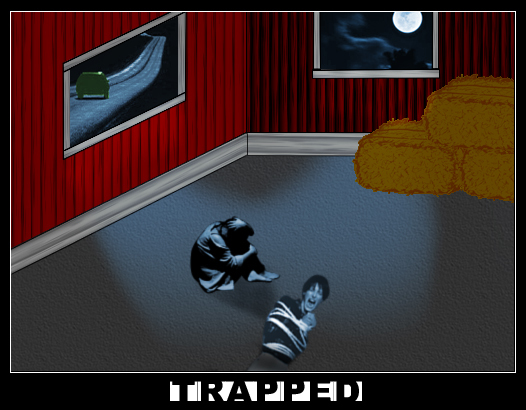 The event being shown in this picture is when Lind discovers Judith in the barn tied to the floor by Caleb. In this picture I wanted the overall feeling to be sadness, but in a way show that there is hope, hope of escape from evil Caleb. The abundance of diagonal lines represents the conflict between Judith and Caleb that is taking place. The lighting in the room causes a blue hue over everything inside and it shows the sadness both Lind and Judith are experiencing. The red walls of the farm represent the danger that lurks within the walls of the Gare farm. Through the window on the left you can see a green car driving away, this shows that there is hope still left of escaping from Caleb and the Gare farm. 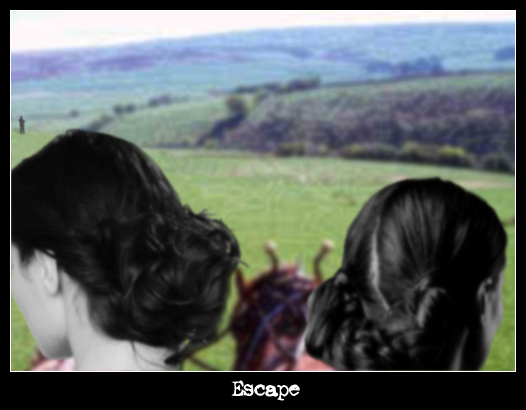 The event shown in this picture is when Judith and Lind run away from the Gare farm in order to escape from Caleb and be free with their male companions. In this picture I wanted the overall feeling to be new beginning as the is a new beginning for Judith and yet another for Lind. The horizontal lines show the peacefulness of a world outside the Gare farm, and the green hills represent the new beginning for Lind and Judith. The man standing straight up in the distance is vertical to show his power in the situation, the power to expose them to Caleb. By making the two women gray scale I was trying to make them whiter in order to show their innocence. The green apple represents Lind's new teaching job. 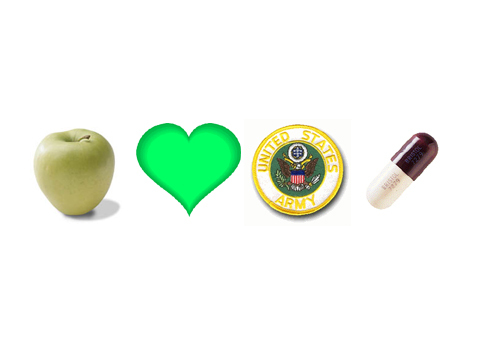 The green heart represents Lind's new found love in Mark Jordan. The army logo represents Lind's saving of Judith, much like an army would save their country. The pill represents Lind's cure for some of Amelia's discontent when she reveals Mark to her.